Macna have been a premium motorcycle apparel manufacturer since 1991 and are one of Europe’s leaders in technical innovation and product development. Featuring a broad range of jackets, pants, gloves, safety protectors and casual wear to suit all riding genres. Macna are a major sponsor of top level international road racers including Jordi Torres, Andrea Locatelli, Jules Cluzel, Julian Simon, Simone Corsi, Michael Laverty, Danilo Petrucci plus our very own Mike Jones. This commitment to racing helps drive innovation and technical advance. From the race tracks of the world to a road near you, Macna has you covered. 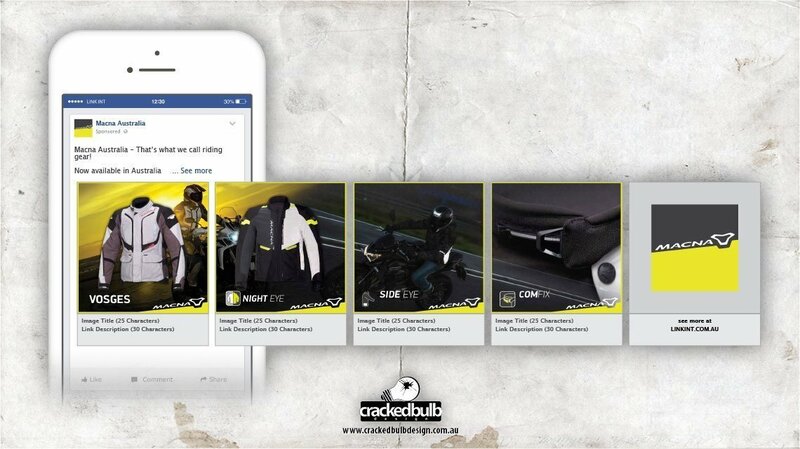 A big thanks to Macna Australia for giving Cracked Bulb Design the opportunity to design their social media artworks.